In partnership with TMT, the Institute for Scientist & Engineer Educators (ISEE) offers TECI, a year-round program that utilizes an annual workshop to stimulate collaboration across the TMT partnership and train early-career students and professionals with the qualifications for successful collaboration in TMT and other large projects. 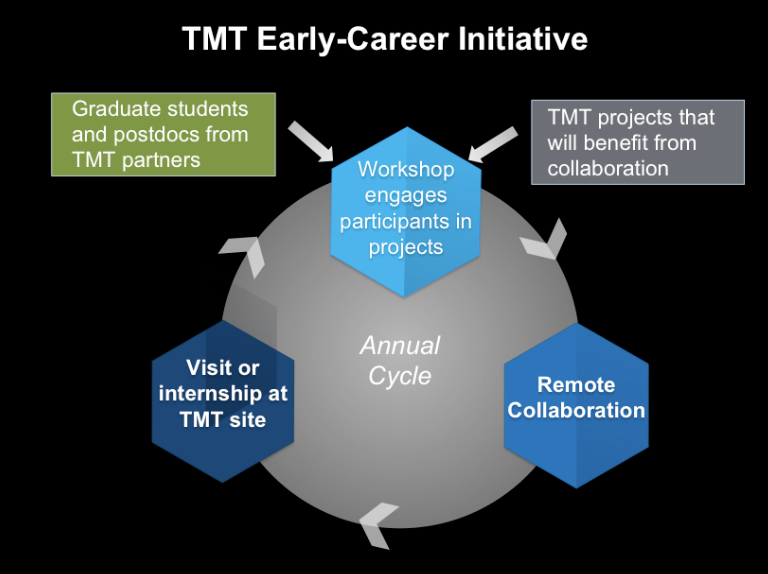 TECI program staff work with the TMT partnership to identify projects that will benefit from engaging early-career people, and increased international collaboration. Projects can be in the areas of science, instruments, or operations. These projects are a centerpiece of the annual workshop, which matches participants with projects in order to stimulate new collaborations. TECI Workshop: The annual TECI workshop is the key event where the early career TMT community comes together, learns new skills, gains initial engagement in TMT projects, and interacts with the broader TMT community. Participants in TECI may elect to participate in only the annual workshop, but the workshop will also stimulate further engagement between small teams or individuals and TMT projects. The most recent TECI Workshop was held December 2-9, 2018, in Pasadena, California. Remote collaboration: A select subset of workshop participants will continue to collaborate remotely after the workshop in small international teams, with advising from a TMT project member. See the TECI Projects page for more information about collaborative projects for TECI participants. Visit or internship: Teams that are remotely collaborating after the workshop, or an individual on one of these teams, may apply for a visit or an internship at a TMT site. The duration of stay can be a short visit of a few weeks, or longer and more like an internship, and will depend upon the project, availability of project consultants and participants, and costs. Participants in TECI gain skills and direct engagement in TMT that will initiate further involvement in TMT, as well as build career qualifications for other projects similar to TMT. TMT projects benefit from involving international partners through TECI, a significant challenge for a partnership that includes Canada, China, India, Japan, and the U.S.
TMT partners will develop their own workforce for TMT and related projects. By investing now, TMT will have the people and collaborations needed to maximize the scientific output of the telescope at first light (~2027). Supporting international collaboration among early-career engineers and scientists will strengthen TMT projects over the full lifetime of the telescope. Graduate students, postdoctoral researchers, and other junior-level professionals from TMT partner sites are invited to apply. In general, priority is given to people involved in TMT projects at their home institution, or who would likely use the TECI experience to get involved in TMT. Each TMT partner works with TECI to establish selection priorities. TECI provides fee waivers to all participants accepted into the program (with funding provided by the TMT Project Office). TECI is able to pay for the cost of accommodations (and some meals) for participants who are able to pay for their own airfare to the workshop, through their advisor or TMT partner office. In some cases, TECI will also pay for airfare. The TECI application includes a travel support question, in which applicants indicate what they are requesting from TECI. See the travel award page to learn about costs and travel awards. TECI has a set of core instructors from ISEE, who has nearly 20 years of experience conducting professional development for early-career students and professionals. The core instructors put together the overall curriculum and utilize the expertise of the TMT community by bringing in many additional instructors, presenters, and project mentors. TECI is funded by the TMT Project Office, with additional funding provided by University of California Observatories. Or use this form to submit a question.